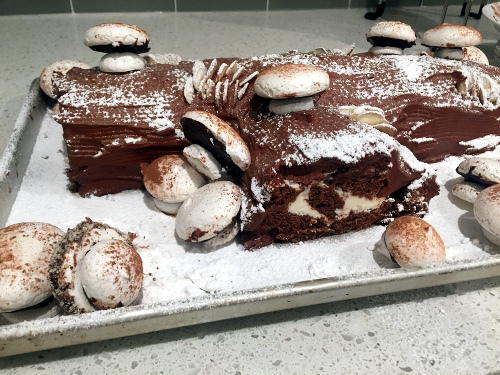 This vegan Buche de Noel was destined to come into my life after I discovered the glory of aquafaba meringues. 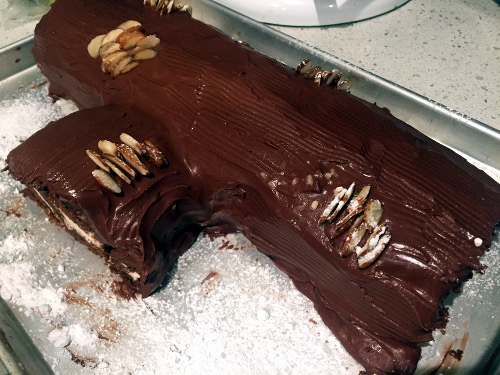 My mom made a Buche every year for Christmas when I was a kid and of course my favorite part was the crunchy meringue topping. I'd steal those puppies right off the baking sheet, pop them in my mouth, and let them melt before they ever made it onto the cake. Aquafaba has revolutionized the vegan world since it's emergence in 2014 and therefore, it's really easy (and fun) to make these meringue mushrooms. As for the cake, I'm not the type of person who choose chocolate over fruity desserts, but I can get behind a cake rolled with a fluffy Swiss buttercream every once in awhile. And besides, I love to decorate cakes and a rotting log in the forest gives ample opportunity to be creative. As for this particular recipe, It's not hard to find a recipe for a Buche de Noel on the internet, and substituting in vegan ingredients is super easy. I settled on a few to veganize based on my desire for a chocolately cake that wouldn't break much when I unwrapped the roll. That's of course the whole trick to the Buche. Every year it's a struggle for me to keep it from breaking and most of the time something kind of falls apart a bit and I have to bandage it with chocolate ganache. But whatever; whoever ends up with that piece just gets more frosting than everyone else. 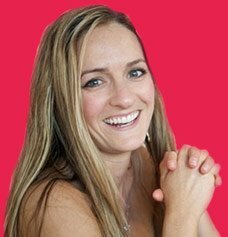 All the pieces are insanely delicious, and I've picked up a few tips to keep yours from splitting on you. I also used aquafaba to make the frostings for this cake. My favorite frosting right now is Swiss meringue. It's so silky and shiny and has much less sweetness than a typical American style buttercream. I actually can't really stand to eat that horribly sweet frosting, but Swiss meringue is so light and yummy. 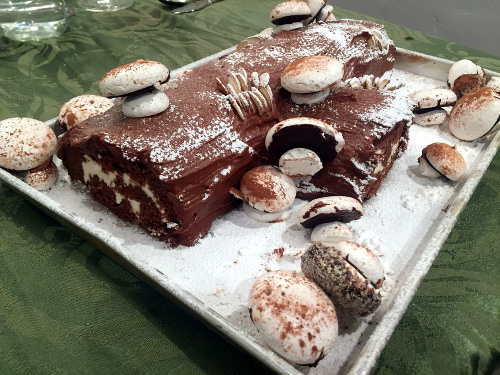 People get seriously creative with their Buches, but this vegan Buche de Noel is a pretty classic take on the dessert. It's a chocolate cake with vanilla filling and chocolate ganache on top. I decorate it with aquafaba meringues shaped into mushrooms or little field animals like mice and hedgehogs. If you've never made one before, don't get freaked out by the list of ingredients or what seems like a lot of steps. 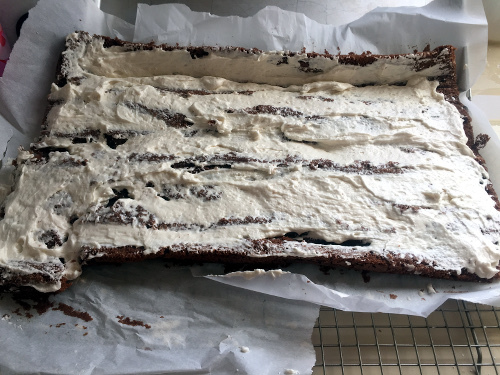 You're really just making sheet cake, rolling it up to cool, and then unrolling it and frosting the cake. 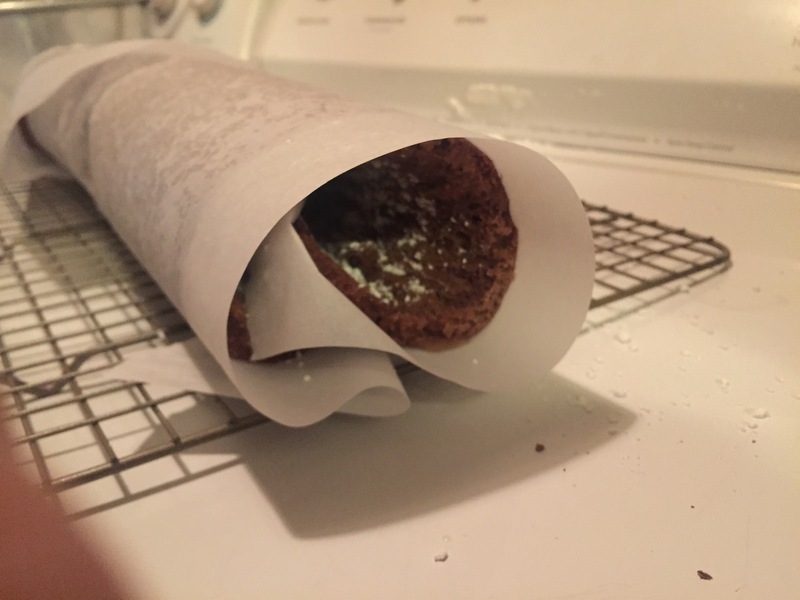 You roll it up again and freeze and then frost the top. 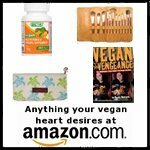 It's not a big deal, but because there are extra steps you might want to start a day ahead. 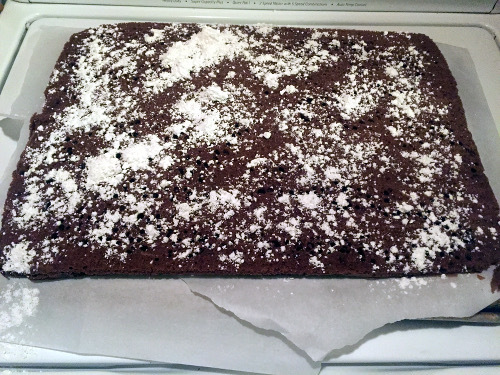 Preheat the oven to 350 degrees F. Spray an 11 x 17 baking sheet (I use a cookie sheet with a rim) with cooking spray. Line the cookie sheet with parchment paper and then spray more cooking spray on the top of the parchment. Flour the top layer so there's a dusting of flour across the whole surface. In a stand mixer, combine the flour, cocoa powder, sugar, baking soda, baking powders, and salt. Add in the vegan butter and mix for about a minute until the pieces are small and crumbly in the dough. Add in the water, soy milk, vanilla, and vinegar and mix for another minute just until it's combined. This is going to be a very runny dough so don't be afraid of the texture here. Pour the chocolate mixture into the prepared cake pan and immediately put it into the oven. Bake for about 20-25 minutes, until a fork inserted in the middle comes out clean. To get the signature rolled look, you need to work quickly with the hot cake so it molds into the correct form. Cover the cake with a piece of parchment paper and then stack another cookie sheet on top of the cake, bottom side down. Quickly flip over the cake so it now rests on the bottom of the new cookie sheet. Remove the original parchment paper that the cake cooked in. If you do this pretty soon after removing it from the oven, it should pull off easily. That's the big reason to grease and flour the parchment paper- it helps to remove this initial piece of parchment paper. When you remove the parchment paper, go slowly so it doesn't tear at the cake. Dust the top (what used to be the bottom) of the cake with confectioner's sugar. This dusting helps you later when you are trying to unroll the cake to fill it with buttercream. 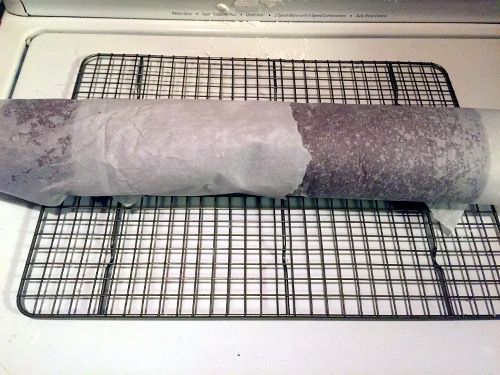 Roll the cake tightly from the long side in, keeping the new piece of parchment paper inside. 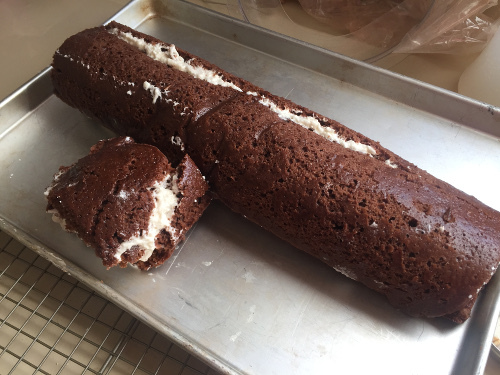 Put the seam side of the roll down on a cookie sheet and let the cake rest until completely cool. 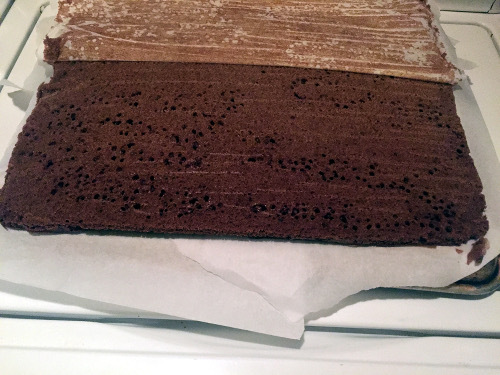 Here's a side angle of the rolled vegan Buche de Noel cooling until it's time to fill it with your vegan Swiss meringue frosting. Yes, this mastery is happening in my laundry room because I live in a tiny house in California. Bring the aquafaba to a boil over high heat and then reduce the temperature to medium. You want to reduce the liquid to only one cup of aquafaba. I did this by continually pouring it back into a measuring cup to catch it once it hit one cup. This gives you a thickened aquafaba. Refrigerate the aquafaba until completely cool. I like to take this step the day before making the frosting to make sure it's nice and thick. 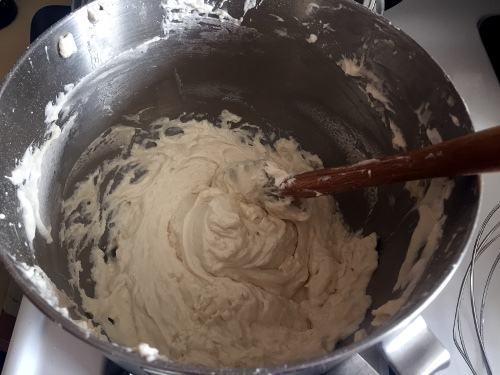 Add the cane sugar and cooled aquafaba to a stand mixer and whip until stiff peaks form. It typically takes me about 15 minutes on high speed, but it could take more or less depending on your machine. Add the confectioner's sugar on low speed until it's just combined. Add in the softened butter and shortening and whip until smooth. I have found that my frosting tends to separate around this point, but if I keep whipping on high it comes back together. Don't give up! Add the vanilla and whip until smooth. 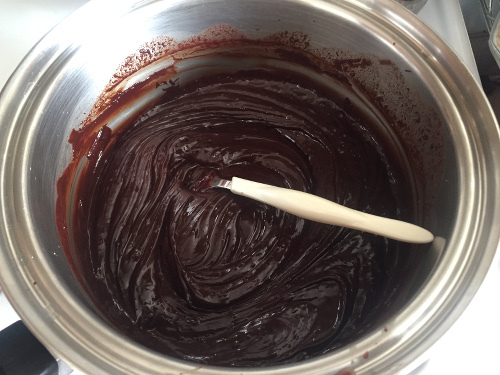 Add the 1/2 cup boiling water into the 12 ounces of bittersweet chocolate and stir until melted and smooth. Gently fold the melted chocolate into the remaining half of buttercream that you didn't use for the filling. Use this frosting to cover the top of the vegan Buche de Noel once it's assembled. 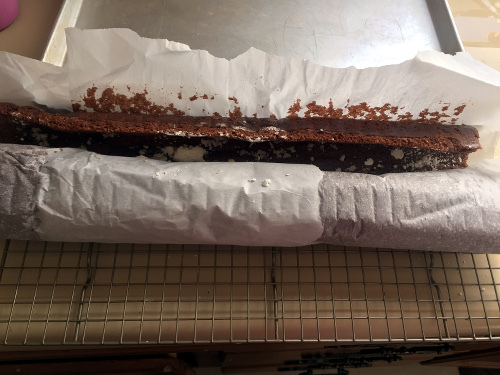 Gently unroll the chocolate sponge cake from the parchment paper and allow it to rest on the paper. Use nimble fingers when unrolling your Buche; this is really the tricky part but if you go slowly it will [mostly] work out fine. Frost the cake with half of the vanilla buttercream frosting and roll the cake back up. In full disclosure, you can see my cake cracked and split a bit here. That happens a little every time, but I just relax and proceed. Once it's frosted no one will notice that it ever fell apart. Just gently roll it back together. See the splits? It's not a perfect science but it won't affect the flavor of the cake! Cover with plastic wrap and freeze it for at least three hours. It could stay frozen for a few months if you want to make this well ahead of time, just make sure it's covered well with aluminum foil. When you're ready to serve, cut a large piece of the end, about 3-4 inches wide, and position it on the side of the log. You can also cut another slice, 2-4 inches and use some chocolate frosting to glue it to the top of the log. Frost the whole thing with the chocolate frosting and use a serrated knife to score the top of the frosting like bark. I added some almond slices to make it look like fungus growing across the log. Sprinkle with confectioner's sugar and decorate with your aquafaba meringue mushrooms. Voila! I hope you have as much fun decorating this cake as I do every year. Sometimes I get these ideas to make amazing little Woodland creatures who prance across the cake. 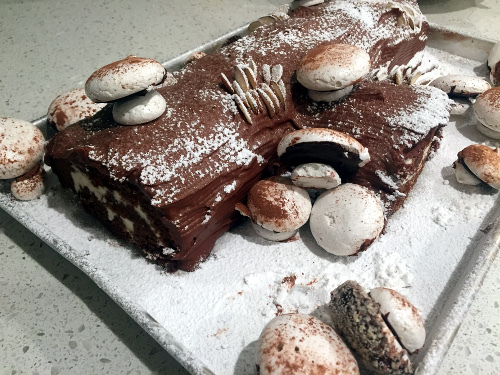 I always seem to run out of time with all the other preparations for the holiday, but one day... Do you make a vegan Buche de Noel with a different style decoration?